We spend a lot of time in our bathrooms, so no small wonder what we want them looking their best -- I for one will be replacing my bathroom floor in 2014 (hopefully with some great new tile!). As we continually update our bathrooms to meet our changing needs and to accommodate the latest trends, they can have a tendency to feel dated. So how do you get a classic, timeless look without making your bathroom feel bland? Solution: integrate a little bit of trendiness, without going overboard. So, what ARE bathrooms looking like for 2014? Let's take a look. Showers are making a major comeback, especially open showers without a lip or "curb" between the shower and the bathroom -- which means, you got it, tile, tile, everywhere. And, bonus, showers without clear edges also feel less confining, while also making the bathroom more spacious. Getting a more exciting shower experience includes a range of options like specialized shower heads, bench seating for the shower, and more, and a smart shower can also offer some serious water saving options, which is great for the environment. Speaking of the green front, low-flow toilets are set to be big in 2014. These toilets offer two great advantages for bathroom design. In the first place, they save water, as advertised, which makes them a great choice for an eco-conscious home. Secondly, they also tend to have a lower profile and sleeker appearance, which can give them a more modern, less obtrusive look: exactly what you want from everyone's least mentionable bathroom fixture. 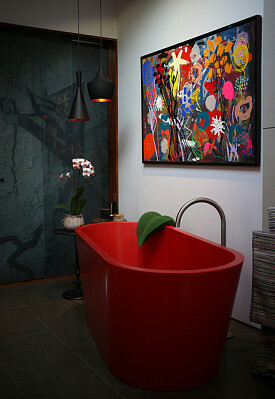 For bathrooms with tubs, standalone tubs, especially soak tubs, are growing popular. These items were once for luxury homes only, but thanks to a range of options from different manufacturers, they're getting more affordable for everyone. That's good news for those of you who like to linger in a nice warm bath on a cold day. And thanks to the range of styles available, you can go for classic clawfoot, sleek and modern, or daring experimental, all depending on your tastes. Bold colors are projected to be big, which is great news for those of you who aren't ready for a full-scale bathroom remodel, but who might want to update a few things. One of the easiest ways to change the feel of a room is to add a new coat of paint, and color effects can dramatically shift your bathroom environment. Talk to your Miami painter about adding a bold accent wall or some more modest trim. You can also consider adding a colorful chaise to the bathroom for lounging if you have enough space, or other bright accent pieces like vases to switch things up on a budget. Remember: when using color, think about how easy it will be to change or move around. If you commit to a boldly-colored tub, counter, cabinet, or other fixture, it can feel dated very quickly and it will be expensive and time-consuming to replace. On the other hand, if you add some mirrors with colorful frames, or a suite of bold vases, they're easy to take down and move around when a blast of color feels like last year's trend. And on the wild side, Kohler has just introduced a Bluetooth-enabled showerhead. Now you can sing along with your favorite music right in the shower stall.